The Dutch regulations on granting PhD degrees are a disgrace. Unlike most other countries, The Netherlands only gives full professors the right to award a PhD (the full professor has the “ius promovendi”). Thus, in the current regulations, if you’re an assistant or associate professor supervising a PhD student, you will need to find a full professor (deemed “the promotor”) who will be fully responsible for the entire PhD process, even if you’re planning to do all supervision yourself. I am relieved that this miserable rule is about to change: February 23rd of this year, the Dutch parliament (Tweede Kamer) has passed an Internationalization Law to bring PhD supervision more in line with the rest of the world (for an English summary, see this Science Guide article). However, the vote for this law in the Dutch Senate (Eerste Kamer) still needs to take place, scheduled for June 6. Much to my surprise, the preliminary reports by the Senate committee raised all sorts of concerns. The senators advocate a hierarchical model in which the full professor is “responsible for the discipline” — a notion at odds with the modern principal investigator approach in which all researchers are peers. The senators are afraid of “undesirable friction”, thereby assuming that making the roles of co-advisors explicit increases rather than decreases friction. The senators gratuitously worry that extending the ius promovendi to non-full professors will reduce the quality of the supervision. The senators argue that granting the right to supervise at the end of a career, is an attractive way of encouraging young professors to engage in such a career. Lastly, in line with the advice of the Raad van State, the senators wonder “whether there is a real problem requiring a new law”. Answers to these concerns and questions will be provided by the Dutch Minster of Education, after which the senators will vote. Despite the senators’ concerns, the general expectation is that the law will pass. In preparing her answer, the minister can use a wide range of documents arguing the need for this change, e.g., by the Young Academy and the ILLC Research School. The Dutch Young Academy lists nine key concerns with the current regulation. They argue that the current law is disconnected from reality in academic life, resulting in insufficient recognition (in reputation, financially, and when competing for grants) for the non-full professors involved. The Young Academy also points out that the present situation makes The Netherlands unattractive for talented researchers seeking to pursue an academic career in The Netherlands (as a point of reference, in my department half of the faculty is non-Dutch). Besides this, the ILLC in its letter (in English) to the executive board of the University of Amsterdam emphasizes problems related to quality control, arguing that in many areas it will be hard to find a full professor who is the actual expert in the field. It can lead to unclear expectations at the very start of a PhD project, when students deciding whether to accept a PhD position need to understand whether they will be working with the full professor or the non-full professor doing the daily supervision. It can lead to confusion during the PhD project, for example when the full professor and co-advisor express different ideas or opinions. Since the full professor is in a position of power, the student may be reluctant to disagree with the full professor. It can lead to an unclear CV of the student, who needs to explain the role of extra advisors (and sometimes even extra co-authors) to new international employers unfamiliar with the Dutch laws. It can lead to publication restrictions for the PhD student, even if the full professor abstains from active involvement in the research. A case in point are ACM rules that in a strict interpretation forbid research students to submit a paper if their advisor is program chair even if that advisor ultimately has a mere ceremonial role in the PhD project. Extra advisors here means fewer publication options. In the past 10 years, I witnessed each of these problems in my many interactions with PhD students and co-advisors under the Dutch regulations (I have worked with seven different non-full professor co-supervisors, and with over 35 past and current PhD students). In my group we try to take the most liberal interpretation of the regulations, handing over supervision responsibilities to the co-advisors as much as possible. Despite this, the bizarre limitations for non-full professors percolate through the PhD process, and affect all involved negatively. To remedy these problems, I trust the senate will vote in favor of the changes to the law. After that, it is up to the universities to take advantage of this law, and change their own doctoral regulations. The ILLC has various useful suggestions. For example, they call for always appointing two supervisors (a good idea already in place at various universities). Given the new law, it then becomes possible to make the young assistant professor (who, e.g., has obtained the grant) the primary supervisor, and to involve a second supervisor in a more advisory role (i.e., not carrying executive responsibility for the success of the PhD). Drafting these new regulations in a way that is most beneficial to the PhD students, and getting them approved will take some time, but I am confident the improvement will be worth the effort. I call on all Dutch senators to vote in favor of the new law. Once approved, I expect that Dutch universities will revise their doctoral regulations to make full use of the new legal possibilities, to the benefit of PhD students in The Netherlands and (young) faculty alike. Where needed, I pledge to use my influence, for example as head of department at TU Delft, to make this happen. UPDATE 7 June 2017: In response to the questions from the Dutch senators, the VSNU (the Association of Dutch Universities) and the presidents of the Dutch Universities provided an addendum explaining how they would implement the law in their regulations. In particular, this addendum emphasizes that universities will grant the “ius promovendum” to associate professors (“UHDs”), but not to assistant professors. Given this addendum, the Senate passed the internationalization law on June 6, 2017. Image credit: Joachim Schlosser, Flickr. After four exciting years of Teaching Software Architecture Using GitHub, we decided to write a paper reflecting on the course and our experiences, and submit it to SIGCSE, the flagship conference of the ACM Special Interest Group on Computer Science Education, typically attended by more than a thousand educators from around the world. We’re very happy that our paper was immediately accepted! C1: The theory of software architecture (design principles, tradeoffs, architectural patterns, product lines, etc) is often very abstract and therefore hard for a student to master. C2: The problems of software architecture are only visible at scale, and disappear once small example systems are used. C3: A software architect needs a combination of technical and social skills: software architecture is about communication between stakeholders, and the architect needs to be able to achieve and explain consensus. Embrace open source: Students pick an open source system of choice and study its architecture. Students use it to learn how to apply architectural theories to realistic systems (C1, C2). Embrace collaboration: Students work in teams of four to study one system in depth (C3). Embrace open learning: Teams share all of their work with other students. Furthermore, students share their main result with the open source community: their architectural description is published as a chapter in an online book resulting from the course (C3). Interact with the architects: Students are required to offer contributions (in the form of GitHub pull requests) to the open source projects, which will expose them to feedback from actual integrators and architects of the open source projects (C1, C2, C3). Combine breadth and depth: Students dive deeply in the system they analyze themselves, and learn broadly from the analyses conducted and presented by other teams (C1, C3). In 2016 the resulting book (created in markdown and git using gitbook) described the architectures of 21 open source systems, including Ember.js, Karma, Neo4j, and SonicPi. The chapters are based both on existing architectural theories (such as architectural views, product lines, and technical debt), as well as the students’ first hand experiences in making actual contributions (merged pull requests) to the open source systems under study. Teaching software architecture is hard. The topic is abstract and is best understood by experiencing it, which requires proper scale to fully grasp its complexity. Furthermore, students need to practice both technical and social skills to become good software architects. To overcome these teaching challenges, we developed the Collaborative Software Architecture Course. In this course, participants work together to study and document a large, open source software system of their own choice. In the process, all communication is transparent in order to foster an open learning environment, and the end-result is published as an online book to benefit the larger open source community. We have taught this course during the past four years to classes of 50-100 students each. Our experience suggests that: (1) open source systems can be successfully used to let students gain experience with key software architecture concepts, (2) students are capable of making code contributions to the open source projects, (3) integrators (architects) from open source systems are willing to interact with students about their contributions, (4) working together on a joint book helps teams to look beyond their own work, and study the architectural descriptions produced by the other teams. Arie van Deursen, Maurício Aniche, Joop Aué, Rogier Slag, Michael de Jong, Alex Nederlof and Eric Bouwers. “A Collaborative Approach to Teaching Software Architecture.” Proceedings of the 48th ACM Technical Symposium on Computer Science Education (SIGCSE), March 2017, Seattle, USA. You can download the paper from the TU Delft institutional repository, or have a look at the slides we used at our SIGCSE 2017 presentation. In 2016, TU Delft adopted Elsevier Pure as its database to keep track of all publications from its employees. At the same time, TU Delft has adopted a mandated green open access policy. This means that for papers published after May 2016, an author-prepared version (pdf) must be uploaded into Pure. I am very happy with this commitment to green open access (and TU Delft is not alone). This decision also means, however, that we as researchers need to do some extra work, to make our author-prepared versions available. To make it easier for you to upload your papers and comply with the green open access policy, here are some suggestions based on my experience so far working with Pure. I can’t say I’m a big fan of Elsevier Pure. In the interest of open access, however, I’m doing my best to tolerate the quirks of Pure, in order to help the TU Delft to share all its research papers freely and persistently with everyone in the world. Elsevier Pure is used at hundreds of different universities. If you work at one of them, this post may help you in using Pure to make your research available as open access. Anyone can browse publications in Pure, available at https://pure.tudelft.nl. 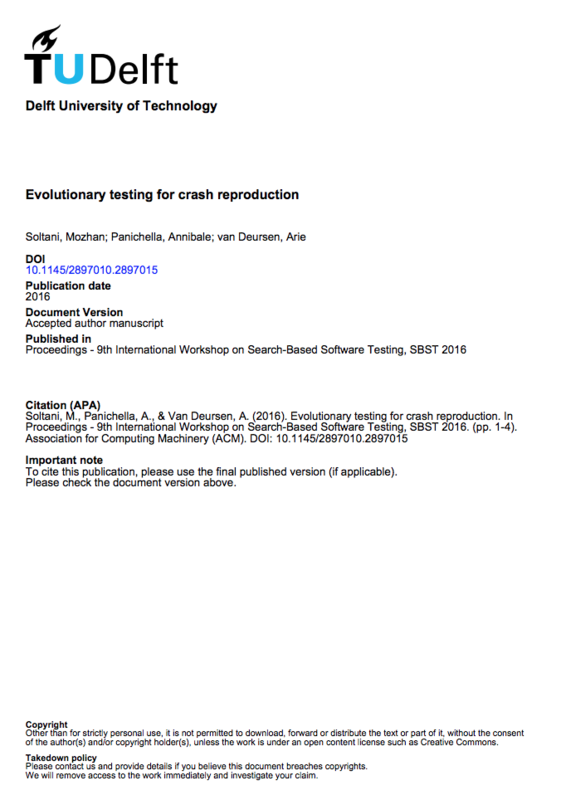 All pages have persistent URL’s, making it easy to refer to a list of all your publications (such as my list), or individual papers (such as my recent one on crash reproduction). For all recent papers I have added a pdf of the version that we as authors prepared ourselves (aka the postprint), as well as a DOI link to the publisher version (often behind a paywall). Thus, you can use Pure to offer, for each publication, your self-archived (green open access) version as well as the final publisher version. Moreover, these publications can be aggregated to the section, department, and faculty level, for management reporting purposes. In this way, Pure data shows the tax payers how their money is spent on academic research, and gives the tax payer free access to the outcomes. The tax payer deserves it that we invest some time in populating Pure with accurate data. To enter publications into pure, you’ll need to login. On https://pure.tudelft.nl, in the footer at the right, you’ll find “Log into Pure”. Use your TU Delft netid. If you’re interested in web applications, you will quickly recognize that Pure is a fairly old system, with user interface choices that would not be made these days. You can start entering a publication by hitting the big green button “Add new” at the top right of the page. It will open a brand new browser window for you. In the new window, click “Research Output”, which will turn blue and expand into three items. Import via Elsevier Scopus, found via “Import from Online Source”. This is by far the easiest, if (1) your publication venue is indexed by Scopus, (2) it is already visible at Scopus (which typically takes a few months), and if (3) you can find it on Scopus. To help Scopus, I have set up an ORCID author identifier and connected it to my Scopus author profile. Import via Bibtex, found via “Import from file”. If you click it, importing from bibtex is one of the options. You can obtain bibtex entries from DBLP, Google Scholar, ACM, your departmental publications server, or write them by hand in your favorite editor, and then copy paste them into Pure. Entering details via a series of buttons and forms (“Create from template”). I recommend not to use this option. If you go against this advice, make sure that if you want to enter a conference paper, you do not pick the template “Paper/contribution to conference”, as you should pick “Conference Contribution/Chapter in Conference Proceedings” instead. Don’t ask me why. In all cases, yet another browser window is opened, in which you can inspect, correct, and save the bibliographic data. After saving, you’ll have a new entry with a unique URL that you can use for sharing your publication. The URL will stay the same after you make additional updates. With each publication, you can add various “electronic versions”. Each can be a file (pdf), a link to a version, or a DOI. For pdfs you want to upload, make sure you check it meets the conditions under your publisher allows self-archiving. The “accepted author manuscript”. This is also called a postprint, and is the version that (1) is fully prepared by you as authors; and that (2) includes all improvements you made after receiving the reviews. Here you can typically upload the pdf as you prepared it yourself. The “final published version”. This is the Publisher’s version. It is likely that the final version is copyrighted by the publisher. Therefore, you typically include a link (DOI) to the final version, and do not upload a pdf to Pure. If you import from Scopus, this field is automatically set. Open, meaning (green) open access. This is what I typically select for the “accepted author manuscript”. Restricted, meaning behind a paywall. This is what I typically select for the final published version. Embargoed, meaning that the pdf cannot be made public until a set date. Can be used for commercial publishers who insist on restricting access to post-prints from institutional repositories in the first 1-2 years. The vast majority (80%) of the academic publishers permits authors to archive their accepted manuscripts in institutional repositories such as Pure. However, publishers typically permit this under specific conditions, which may differ per publisher. You can check out my Green Open Access FAQ if you want to learn more about these conditions, and how to find them for your (computer science) publisher. Once uploaded, your pdf is available for download for everyone. Pure adds a cover page with meta-data such as the citation (how it is published) and the DOI to the final version. This cover page is useful, as it helps to meet the intent of the conditions most publishers require on green open access publishing. Google Scholar indexes Pure, so after a while your paper should also appear on your Scholar page. “In preparation”: Literally a pre-print. Your paper can be considered a draft and may still change. “Submitted”: You submitted your paper to a journal or conference where it is now under review. “Accepted/In press”: Yes, paper accepted! This also means that you as an author can share your “accepted author manuscript”. “E-Pub ahead of print”: I don’t see how this differs from the Accepted state. “Published”: The paper is final and has been officially published. In my Green Open Access FAQ I provide an answer to the question Which Version Should I Self-Archive. I create a bibtex entry for an @inproceedings (conference, workshop) or @article (journal) publication. I upload the bibtex entry into pure. I set the Publication Status to “Accepted”. I share the resulting Pure link on Twitter with the rest of the world so that they can read my paper. I add the DOI link to the final published version. I provide the missing bibliographic meta-data (page numbers, volume, number, …). I set the Publication Status to “Published”. I set the Entry Status to “for approval” (by the library who can then change it into an immutable “approved” if they think this is a valid entry). My preprint links I shared still contain a pointer to the self-archived pdf, but now also to the official version at the publisher for those who have access through the pay wall. The Pure page for your paper including all meta-information and all versions of that paper (example) in principle is stable, and its URL provide a permanent link (unless you delete it). You can also directly link to the individual pdfs you upload (example). However, these are more volatile: If you upload a newer version the old link will be dead. Moreover, in some cases the (TU Delft) library has moved pdfs around thereby destroying old pdf links. Therefore, I recommend to use links to the full record rather than individual pdfs when sharing pure links. Elsevier does not like it if you self-archive papers published in Elsevier journals into Elsevier Pure. The official rules are that Elsevier journal papers are subject to an embargo, yet at the same time can be published with a CC-BY-NC-ND license on arxiv. Combining these two leads to the following steps, assuming you have a pre-print (never reviewed), and a post-print (the author-prepared accepted version after review). Upload your pre-print onto Arxiv. Add a footnote to your post-print stating: This manuscript version is made available under the CC-BY-NC-ND 4.0 license. Update your arxiv pre-print with your CC-BY-NC-ND licensed post-print, and add publication details (journal name, volume, issue) to your arxiv entry. Upload the post-print as author-accepted version to your Pure entry, make it available immediately, and set the license to CC-BY-NC-ND. Note that the Elsevier rules explicitly allow steps 1-3, and in fact insists on the CC-BY-NC-ND license. Elsevier does not suggest you take step 5, but as a consequence of the CC-BY-NC-ND license you are permitted to do so. What Elsevier would want you to do instead of step 5 is add the postprint to Pure under a (2 year) embargo, thus delaying (green) open access availability by 2 years. Elsevier Pure even supports this embargo option as one of the “access” options, in which you could enter the end-date of such an embargo. Note: Yes, these steps are annoying. But: at the time of writing (2019), universities in Germany, Sweden, and California have no access to recent papers published by Elsevier. If you want your paper to be read in any of these countries make sure to upload it into your university repository. If you don’t want to go through these steps and you want your paper to be read, I recommend you pick a different publisher. Josh Bolick on this embargo bypass. Pure contains official employee names as registered by TU Delft. Some authors publish under different (variants of their) names. For example, Dutch universities have trouble handling the complex naming habits of Portuguese and Brazilian employees. If Pure is not able to map an author name to the corresponding employee, find the author name in the publication, click edit, and then click “Replace”. This allows searching the TU Delft employee database for the correct person. If Pure has found the correct employee, but the name displayed is very differently from what is listed on the publication itself, you can edit the author for that publication, and enter a different first and last name for this publication. If you’re logged in, you can download your publication list in various formats, including BibTex (you’ll find the button for this at the bottom of the page). I prefer bibtex entries that have a url back to the place where all info is. Therefore, I wrote a little Python script to scrape a Pure web page (mine, yours, or anyone’s), that adds such information. I use the bibtex entries produced by this script to populate my Orcid profile as well as our Departmental Publication Server with publications from Pure that link back to their corresponding pure page. 20 November 2016: Version 0.1, for internal purposes. 07 December 2016: Version 0.2, first public version. 14 December 2016: Version 0.3, minor improvements. 13 January 2017: Version 0.4, updated Google Scholar information. 16 March 2017: Version 0.5, updated approval states based on correction from Hans Meijerrathken. 17 March 2017: Version 0.6, life cycle and exporting added. 24 November 2017: Version 0.7, simplified life cycle and approval states. 03 March 2018: Version 0.8, added info on populating Orcid from Pure. 08 March 2019: Version 1.0, added info on publishing Elsevier papers. Acknowledgments: Thanks to Moritz Beller for providing feedback and trying out Pure. (Opinionated) answers to frequently asked questions on (green) open access, from a computer science (software engineering) research perspective. Disclaimer: IANAL, so if you want to know things for sure you’ll have to study the references provided. Use at your own risk. Green open access is trickier than I thought, so I might have made mistakes. Corrections are welcome, just as additional questions for this FAQ. Thanks! What is a publisher’s version? Do publishers allow Green Open Access? Under what conditions is Green Open Access permitted? What is Yellow Open Access? What are the Self-Archiving policies of common computer science venues? Is Green Open Access compulsory? Should I share my pre-print under a Creative Commons license? What is a good place for self-archiving? Can I use PeerJ Preprints for Self-Archiving? Can I use ResearchGate or Academia.edu for Self-Archiving? Which version(s) should I self-archive? What does Gold Open Access add to Green Open Access? 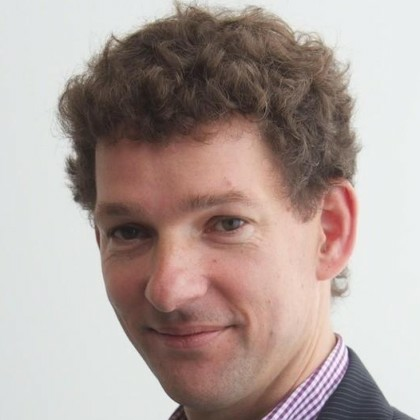 Will Green Open Access hurt commercial publishers? What is the greenest publisher in computer science? Should I use ACM Authorizer for Self-Archiving? As a conference organizer, can I mandate Green Open Access? What does Green Open Access cost? Should I adopt Green Open Access? Where can I learn more about Green Open Access? In Green Open Access you as an author archive a version of your paper yourself, and make it publicly available. This can be at your personal home page, at the institutional repository of your employer (such as the one from TU Delft), or at an e-print server such as arXiv. The word “archive” indicates that the paper will remain available forever. A pre-print is a version of a paper that is entirely prepared by the authors. Since no publisher has been involved in any way in the preparation of such a pre-print, it feels right that the authors can deposit such pre-prints where ever they want to. Before submission, the authors, or their employers such as universities, hold the copyright to the paper, and hence can publish the paper in on line repositories. Following the definition of SHERPA‘s RoMEO project, pre-prints refer to the version before peer-review organized by a publisher. Following the RoMEO definitions, a post-print is a final draft as prepared by the authors themselves after reviewing. Thus, feedback from the reviewers has typically been included. Here a publisher may have had some light involvement, for example by selecting the reviewers, making a reviewing system available, or by offering a formatting template / style sheet. The post-print, however, is author-prepared, so copy-editing and final markup by the publisher has not been done. While pre- and post-prints are author-prepared, the final publisher’s version is created by the publisher. The publishers involvement may vary from very little (camera ready version entirely created by authors) up to substantial (proof reading, new markup, copy editing, etc.). Publishers typically make their versions available after a transfer of copyright, from the authors to the publisher. And with the copyright owned by the publisher, it is the publisher who determines not only where the publisher’s version can be made available, but also where the original author-prepared pre- or post-prints can be made available. Self-archiving of non-published material that you own the copyright to is always allowed. Whether self-archiving of a paper that has been accepted by a publisher for publication is allowed depends on that publisher. You have transferred your copyright, so it is up to the publisher to decide who else can publish it as well. Different publishers have different policies, and these policies may in turn differ per journal. Furthermore, the policies may vary over time. The SHERPA project does a great job in keeping track of the open access status of many journals. You’ll need to check the status of your journal, and if it is green you can self-archive your paper (usually under certain publisher-specific conditions). In the RoMEO definition, green open access means that authors can self-archive both pre-prints and post-prints. Since the publisher holds copyright on your published paper, it can (and usually does) impose constraints on the self-archived versions. You should always check the specific constraints for your journal or publisher, for example via the RoMEO journal list. You generally can self-archive pre- and post-prints only, but not the publisher version. In the meta-data of the self-archived version you need to add a reference to the final version (for example through its DOI). In the meta-data of the self-archived version you need to include a statement of the current ownership of the copyright, sometimes through specific sentences that must be copy-pasted. The repository in which you self-archive should be non-commercial. Thus, arXiv and institutional repositories are usually permitted, but commercial ones like PeerJ Preprints, Academia.edu or ResearchGate are not. Some commercial publishers impose an embargo on post-prints. For example Elsevier permits sharing the post-print version on an institutional repository only after 12-24 months (depending on the journal). Usually meeting the demands of a single publisher is relatively easy to do. Given points 2 and 3, it typically involves creating a dedicated pdf with a footnote on the first page with the required extra information. However, every publisher has its own rules. If you publish your papers in a range of different venues (which is what good researchers do), you’ll have to know many different rules if you want to do green open access in the correct way. Some publishers (such as Wiley) allow self-archiving of pre-prints only, and not of post-prints. This is referred to as yellow open access in RoMEO. Yellow is more restrictive than green. As an author, I find yellow open access frustrating, as it forbids me to make the version of my paper that was improved thanks to the reviewers available via open access. As a reviewer, I feel yellow open access wastes my effort: I tried to help authors by giving useful feedback, and the publisher forbids my improvements to be reflected in the open access version. Gold Open Access refers to journals (or conference proceedings) that are completely accessible to the public without requiring paid subscriptions. Often, gold implies green, for example when a publisher such as PeerJ, PLOS ONE or LIPIcs adopts a Creative Commons license — which allows anyone, including the authors, to share a copy under the condition of proper attribution. The funding model for open access is usually not based on subscriptions, but on Article Processing Charges, i.e., a payment by the authors for each article they publish (varying between $70 (LIPIcs) up to $1500 (PLOS ONE) per paper). Hybrid open access refers to a restricted (subscription-funded) journal that permits authors to pay extra to make their own paper available as open access. This practice is also referred to as double dipping: The publisher catches revenues from both subscriptions and author processing charges. University libraries and funding agencies do not like hybrid access, since they feel they have to pay twice, both for the authors and the readers. Green open access is better than hybrid open access, simply because it achieves the same (an article is available) yet at lower costs. ACM: Green, e.g., TOSEM, see also the ACM author rights. For ACM conferences, often the author-prepared camera-ready version includes a DOI already, making it easy to adhere to ACM’s meta-data requirements. Note that some ACM conference are gold open access, for example the ones published in the Proceedings of the ACM on Programming Languages. IEEE: Green, e.g., TSE. The IEEE has a policy that the IEEE makes a version available that meets all IEEE meta-data requirements, and that authors can use for self-archiving. See also their self-archiving FAQ. Springer: Green, e.g., EMSE, SoSyM, LNCS. Pre-print on arXiv, post-print on personal page immediately and in repository in some cases immediately and in others after a 12 month embargo period. Elsevier: Mostly green, e.g., JSS, IST. Pre-print allowed; post-print with CC BY-NC-ND license on personal page immediately and in institutional repository after 12-48 month embargo period. To circumvent the embargo you can publish the pre-print on arxiv, update it with the post-print (which is permitted), and update the license to CC BY-NC-ND as required by Elsevier, after which anyone (including you) can share the postprint on any non-commercial platform. Wiley: Mostly yellow, i.e., only pre-prints can be immediately shared, and post-prints (even on personal pages) only after 12 month embargo. E.g. JSEP. PeerJ Computer Science: Gold (creative commons) and green. Usenix: Gold since 2008. Published with PeerJ. Authors retain their copyright. IEEE Access: The ‘mega-journal’ from IEEE covering all IEEE’s fields of interest. PLOS ONE: The successful (nonprofit) mega-journal that also publishes computer science papers. Many venues in Artificial Intelligence, including AAAI, the Journal of Machine Learning Research, Computational Linguistics, the Semantic Web Journal, or the Annual Conference on Neural Information Processing Systems (NIPS). Specialized conferences or journals such as the Journal of Object Technology or Computational Linguistics. Funding agencies (NWO, EU, Bill and Melinda Gates Foundation, …) as well as universities (TU Delft, University of California, UCL, ETH Zurich, Imperial College, …) are increasingly demanding that all publications resulting from their projects or employees are available in open access. As of 1 May 2016 the so-called Green Road to Open Access publishing is mandatory for all (co)authors at TU Delft. The (co)author must publish the final accepted author’s version of a peer-reviewed article with the required metadata in the TU Delft Institutional Repository. This makes sense: The TU Delft wants to have copies of all the papers that its employees produce, and make sure that the TU Delft stakeholders, i.e. the Dutch citizens, can access all results. Note that TU Delft insists on post-prints that include reviewer-induced modifications. The Dutch national science foundation NWO has a preference for gold open access, but accepts green open access if that’s impossible (“Encourage Gold, require immediate Green“). You should only do this if you are certain that the publisher’s conditions on self-archiving pre-prints are compatible with a Creative Commons license. If that is the case, you probably are dealing with a golden open access publisher anyway. Creative Commons licenses are very liberal, allowing anyone to re-distribute (copy) the licensed work (under certain conditions, including proper attribution). This effectively nullifies (some of) the rights that come with copyright. For that reason, publishers that insist on owning the full copyright to the papers they publish typically disallow self-archiving earlier versions with such a license. This “not for redistribution” is incompatible with Creative Commons, which is all about sharing. Furthermore, a Creative Commons license is irrevocable. So once you picked it for your pre-print, you effectively made a choice for golden open access publishers only (some people might consider this desirable, but it seriously limits your options). Therefore, my suggestion would be to keep the copyright yourself for as long as you can, giving you the freedom to switch to Creative Commons once you know who your publisher is. Your employer may require that you use your institutional repository (such as the TU Delft Repository). This helps your employer to keep track of how many of its publications are available as open access. The higher this number, the stronger the position of your employer when negotiating open access deals with publishers. Institutional archiving still allows you to post a version elsewhere as well. Subject repositories such as arXiv offer good visibility to your peers. In fields like physics using arXiv is very common, whereas in Computer Science this is less so. A good thing about arXiv is that it permits versioning, making it possible to submit a pre-print first, which can then later be extended with the post-print. You can use several licenses. If you intend publishing your paper, however, you should adopt arXiv’s Non-Exclusive Distribution license (which just allows arXiv to distribute the paper) instead of the more generous Creative Commons license — which would likely conflict with the copyright claims of the publisher of the refereed paper. Your personal home page is a good place if you want to offer an overview of your own research. Home page URLs may not be very permanent though, so as an approach to self archiving it is not suitable. You can use it in addition to archiving in repositories, but not as a replacement. Probably not — and it’s also not what PeerJ Preprints are intended for. PeerJ Preprints is a commercial eprint server requiring a Creative Commons license. It is intended to share drafts that have not yet been peer reviewed for formal publication. It offers good visibility (a preprint on goto statements attracted 15,000 views), and a smooth user interface for posting comments and receiving feedback. Articles can not be removed once uploaded. The PeerJ Preprint service is compatible with other golden open access publishers (such as PeerJ itself or Usenix). The PeerJ Preprint service, however, is incompatible with most other publishers (such as ACM, IEEE, or Springer) because (1) the service is commercial; (2) the service requires Creative Commons as license; (3) preprints once posted cannot be removed. So, if you want to abide with the rules, uploading a pre-print to PeerJ Preprints severely limits your subsequent publication options. No — unless you only work with liberal publishers with permissive licenses such as Creative Commons. ResearchGate and Academia.edu are researcher social networks that also offer self-archiving features. As they are commercial repositories, most publishers will not allow sharing your paper on these networks. The ResearchGate copyright pages provide useful information on this. Many journals will also allow an author to retain rights to all pre-publication drafts of his or her published work, which permits the author to post a pre-publication version of the work on Academia.edu. According to Sherpa, which tracks journal publishers’ approach to copyright, 90% of journals allow uploading of either the pre-print or the post-print of your paper. This seems misleading to me: Most publishers explicitly dis-allow posting preprints to commercial repositories such as Academia.edu. In both cases, the safer route is to use permitted places such as your home page or institutional repository for self-archiving, and only share links to your papers with ResearchGate or Academia.edu. You can receive rapid feedback on a version that is available early. It allows you to claim ownership of certain ideas before your competition. You may want to keep some results or data secret from your competition until your paper is actually accepted for publication. You may want to avoid confusion between different versions (pre-print versus post-print). You may be scared to leave a trail of rejected versions submitted to different venues. You may want to submit your pre-print to a venue adopting double blind reviewing, requiring you to remain anonymous as author. Publishing your pre-print during the reviewing phase would make it easy for reviewers to find your paper and connect your name to it. For these reasons, and primarily to avoid confusion, I typically share just the post-print: The camera-ready version that I create and submit to the publisher is also the version that I self-archive as post-print. it removes the burden of making articles publicly available from the researcher to the publisher. it places a paper in a venue that is entirely open access. Thus, also other papers improving upon, or referring to your paper (published in the same journal) will be open access too. gold typically implies green, i.e., the license of the journal is similar to Creative Commons, allowing anyone, including the authors, to share a copy under the condition of proper attribution. Maybe. But most academic publishers already allow green open access, and they are doing just fine. So I would not worry about it. The greenest publisher should be the one imposing the least restrictions on self-archiving. From that perspective, publishers who want to be the greenest should in fact want to be gold, making their papers available under a permissive Creative Commons license. An example is Usenix. Among the non-golden publishers, the greenest are probably the non-commercial ones, such as IEEE and ACM: They require simple conditions that are usually easy to meet. The ACM, “the world’s largest educational and scientific computing society”, claims to be among the “greenest” publishers. Based on their tolerant attitude towards self-archiving of post-prints this may be somewhat justified. Furthermore, their Authorizer mechanism permits setting up free access to the publisher’s version. But greenest is gold. So I look forward to the day the ACM follows its little sister Usenix in a full embrace of golden open access. The ACM offers the Authorizer mechanism to provide free access to the Publisher’s Version of a paper, which only works from one user-specified URL. For example, I can use it to create a dedicated link from my institutional paper page to the publisher’s version. However, Authorizer links cannot be accessed from other pages, and there is no point in emailing or tweeting them. Since only one authorizer link can exist per paper, I cannot use an authorizer link for both my institutional repository, and for the repository of my funding agency. These restrictions on Authorizer links make them unsuitable as a replacement for self-archiving (let alone as a replacement for golden open access). Green open access is self-archiving, giving the authors the permission to archive their own papers. As a conference organizer working with a non open access (ACM, IEEE, Springer-Verlag) publisher, you are not allowed to archive and distribute all the papers of the conference yourself. What several conferences do instead, though, is collecting links to pre- or post-prints. For example, the on line program of the recent OOPSLA 2016 conference has links to both the publisher’s version (through a DOI) and to an author-provided post-print. For OOPSLA, 20 out of the 52 (38%) of the authors provided such a link to their paper, a number that is similar in other conferences adopting such preprint linking. As a conference organizer, you can do your best to encourage authors to submit their pre-print links. Or you can use your influence in the steering committee to push the conference to switch to an open access publisher, such as LIPIcs or Usenix. As an author, you can help by actually offering a link to your pre-print. For authors, green open access typically costs no money. University repositories, arXiv, and PeerJ Preprints are all free to use. You need to find out the specific conditions under which the publisher of your current paper permits self-archiving. You need to actually upload your paper to some repository, provide the correct meta-data, and meet the publisher’s constraints. The fact that open access is free for authors does not mean that there are no costs involved. For example, the money to keep arXiv up and running comes from a series of sponsors, including TU Delft. Improved Results: Increased usage of your results in either industry or academia will put your results to the real test, and will help you improve your results. Besides that, (green) open access is a way of delivering to the tax payers what they paid for: Your research results. SHERPA / RoMEO: Green Open Access conditions and restrictions for all journals and publishers. The UCL Open Access FAQs. 6 November 2016: Version 0.1, Initial version, call for feedback. 14 November 2016: Version 0.2, update on commercial repositories. 18 November 2016: Version 0.3, update on ACM Authorizer. 20 November 2016: Version 0.4, added TOC, update on commercial repositories. 06 December 2016: Version 0.5, updated information on ACM and IEEE. 20 December 2016: Version 0.6, added info on Creative Commons and AI venues. 18 November 2018: Version 0.8, updated info on Elsevier. Acknowledgments: I thank Moritz Beller (TU Delft) and Dirk Beyer (LMU Munich) for valuable feedback and corrections. © Arie van Deursen, November 2016. Licensed under CC BY-SA 4.0. Within the Software Engineering Research Group of Delft University of Technology, we are looking for an enthusiastic and strong PhD student in the area of “test amplification”. The PhD project will be in the context of the new STAMP project funded by the H2020 programme of the European Union. STAMP is a 3-year R&D project, which leverages advanced research in automatic test generation to push automation in DevOps one step further through innovative methods of test amplification. 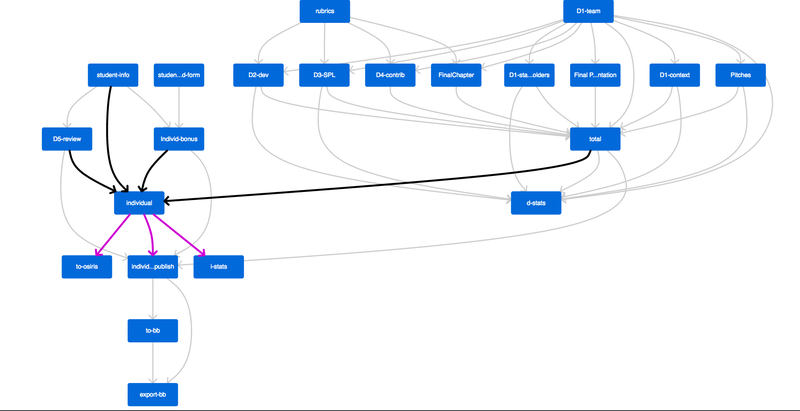 It will reuse existing assets (test cases, API descriptions, dependency models), in order to generate more test cases and test configurations each time the application is updated. This project has an ambitious agenda towards industry transfer. In this regard, the STAMP project gathers 3 research groups which have strong expertise in software testing and continuous development as well as 6 industry partners that develop innovative open source software products. The PhD student employed by Delft University of Technology will conduct research as part of the STAMP project together with the STAMP partners. Employment will be for a period of four years. The PhD student will enroll in the TU Delft Graduate School. The primary line of research for the TU Delft PhD student will revolve around runtime test amplification. Online test amplification automatically extracts information from logs collected in production in order to generate new tests that can replicate failures, crashes, anomalies and outlier events. The research will be devoted to (i) defining monitoring techniques and log data analytics to collect run-time information; (ii) detecting interesting behaviors with respect to existing tests; (iii) creating new tests for testing the behaviors of interest, for example through state machine learning or genetic algorithms; (iv) adding new probes and new log messages into the production code to improve its testability. Besides this primary line of research, the PhD student will be involved in lines of research led by the other STAMP partners, addressing unit test amplification and configurability test amplification. Furthermore, the PhD student will be involved in case studies and evaluations conducted in collaboration with the industrial partners in the consortium. From the TU Delft Software Engineering group, several people will be involved, including Arie van Deursen (principal investigator), Andy Zaidman, and Mauricio Aniche. Furthermore, where possible collaborations with existing projects will be setup, such as the 3TU Big Software on the Run and TestRoot projects. For more information on this vacancy and the STAMP project, please contact Arie van Deursen. To apply, please follow the instructions of the official opening at the TU Delft Vacancies pages. Your letter letter should include a clear motivation why you want to work on the STAMP project, and an explanation of what you can bring to the STAMP project. Also provide your CV, (pointers to) written material (e.g. a term paper, an MSc thesis, or published conference or journal papers), and if possible pointers to (open source) software projects you have contributed to. The vacancy will be open until 2 February 2017, but applying early never hurts. We look forward to receiving your application!